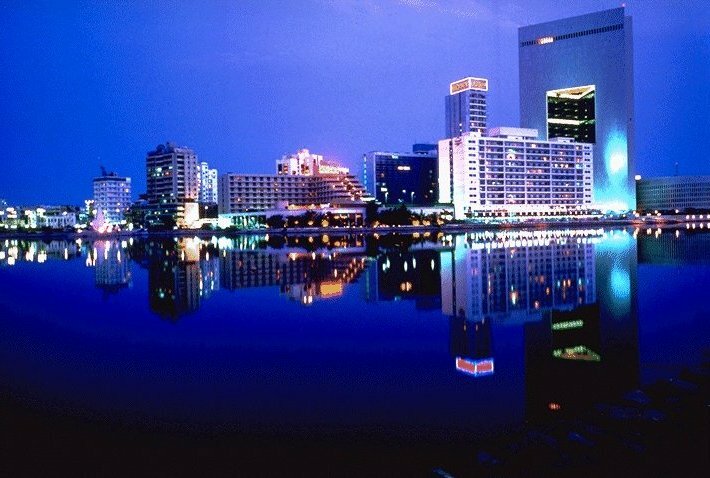 �Jeddah�, as pronounced by its people, means prosperity and happiness. It is also pronounced as �Jadda� meaning grandmother referring to mother Eve. This is in accordance to the legend that she landed here and is buried in the graveyard just outside the historical area of the old city. Another pronunciation is �Joddah� and this means a narrow passage between two mountains or a long road. Jeddah is a city of mystery, rich with tradition, history, culture and a unique heritage. It is mentioned by the Prophet Muhammed (PBUH) and his Caliphs and its importance goes back even before the Islamic period. Jeddah has been mentioned by many travelers in their journals, some describing it as "the city surrounded by walls with beautiful markets and teeming with buildings" whilst others described it as "the small city on the Red Sea coast crowded with pilgrims". Apparently there were inns, caravan sarays, and hostels catering to travelers and pilgrims. Present city has expanded and transformed into a metropolis but still holds true to its original charm and uniqueness thereby making it superb for its residents and a must for those who wish to visit her. If you seek the visually spectacular, Jeddah will never disappoint you. And there is probably nowhere more spectacular than Jeddah's floodlit Corniche in the evening, where over 400 open-air sculptures (pictured) provide a feast for the eye. Their diversity is extraordinary, from the solid curves of Henry Moore to the poetic beauty of Mustafa Sunbal's seagulls in flight. Some may cause aesthetic ambivalence -- the cars embedded in a vast concrete block for instance. They are a good talking point, nonetheless, and in Jeddah everyone has his favourite sculpture. Spectacular, too, is the gigantic fountain (pictured), situated opposite Al-Salam Palace, just across the water. 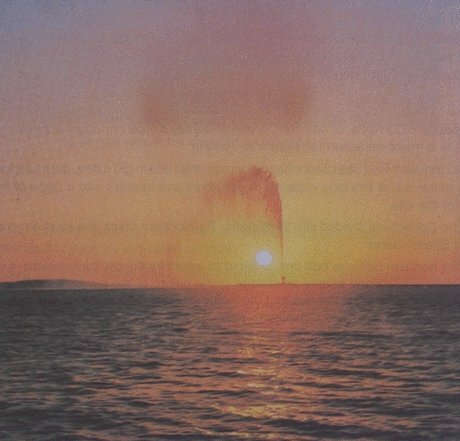 It is said to be the world's highest fountain, exceeding even Geneva's famous jet d'eau by several metres. When floodlit by night, the fountain is visible for miles around. After the Mahgreb (sunset) prayer, the Corniche springs into life, with Saudi families dining al fresco. Picnicking is a favourite local hobby, and is regarded as an ideal opportunity to get together for a family chat and a substantial supper. Vendors with handcarts roam the beach, selling candy floss, fizzy drinks and spicy chickpeas. Giant funfairs have blossomed along the northern sections of the Corniche. 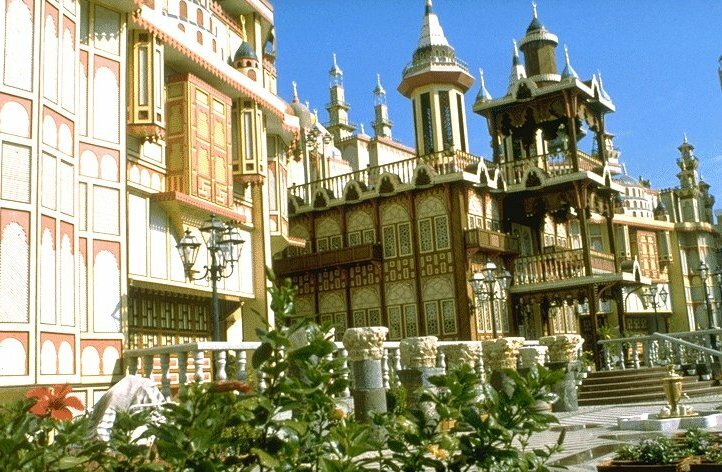 Built in two sections strictly segregated by gender, these contain all the traditional rides and thrills, as well as a good selection of gastronomic fairground essentials. For those whose dining requirements are more sedate, Jeddah offers a wonderfully diverse series of treats for the tastebuds. Whether your taste is for Middle Eastern, ethnic or international food, your expectations are more than met by the city's many excellent restaurants. The larger hotels offer well-priced, international menus of an extremely high standard. Worldwide cuisine is often 'themed' in hotel restaurants, so you can enjoy American, French, Mexican, Italian, seafood or whatever else takes your fancy on different nights of the week. For those on a tight budget, Middle Eastern take-away restaurants abound, and many Jeddah residents maintain that it is these which serve the most delicious, reasonably-priced experience for your palate. Here you can buy the traditional shawerma -- thinly-sliced lamb or chicken, rolled with pickles, salad and french-fries into a delicious Arabic sandwich. Falafels are another great favourite -- these are deep-fried balls of ground chick peas, flavoured with garlic and herbs, and cost just a few riyals for a large bag full. The ubiquitous fast-food chains also have several branches in Jeddah. In these, as in all other restaurants, there are always two separate sections; one for 'families' and one for 'bachelors'. Those whose party includes only men should eat in the bachelor section (sometimes known as 'singles'), which is usually situated in the front of the restaurant overlooking the street. The family section, however, is discreetly tucked away and usually has screened windows. Eating out is perhaps Jeddah's favourite occupation, but shopping comes a close second. Jeddah's early traditions as a trading centre continue unabated in today's cosmopolitan city, and it is possible to buy almost anything in its souqs and shopping malls. Stick to the latter if you prefer to shop under cover in air-conditioned comfort, but for the more adventurous, the souqs have a great deal of charm and are still the main source of a good bargain. Haggling is essential to all Middle Eastern shopping, although prices are sometimes fixed in the larger department stores. Jeddah's status as a trading centre has been maintained down the centuries and many of today's major trading companies have their headquarters there. Two large, government-owned companies are based in Jeddah, too: the Saudi Arabian Marketing and Refining Company (SAMAREC) and Saudia, which is the national airline. Both these companies employ a huge work force, and their presence exerts a considerable impact on the local economy. By contrast, industry still plays only a minor part in Jeddah's economy, although one industry which does seem to be thriving is tourism. 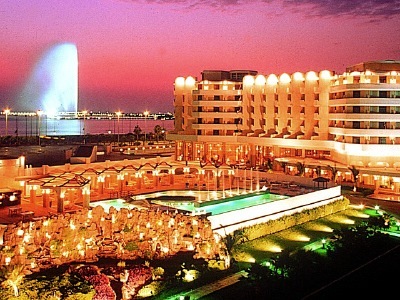 Increased mobility, as a result of lower domestic air fares and better connecting highways, means that many Saudi nationals are now able to enjoy the delights of Jeddah as a holiday resort. Attracted by the Red Sea, the excellent restaurants and shops and the cosmopolitan flavour of the city, Saudis are now taking several short holidays a year, and Jeddah is an increasingly popular destination. Hotels report an increased demand for accommodation, and builders are finding that the demand for new residences is on the increase, as many wealthy families from Riyadh and other cities in the Kingdom are building holiday homes in Jeddah. Jeddah's glitter continues undimmed, and no-one who has visited the city will be able to forget its unique atmosphere. Saudi Arabia is one of the driest countries in the world, with rainfall averaging less than 5 inches per year. Marked seasons, in the European or American sense, do not exist. The climate is principally determined by the southerly shift in wind patterns during the winter months which brings rain and cool weather. Other factors such as latitude, proximity to the sea and altitude, also affect the climate. In the Empty Quarter, the great south-eastern sand desert, ten years may pass with no rain. The Aseer Highlands in the south receive rainfall due to the monsoon that may exceed 255mm (10 in) per year. Jeddah, on the shores of the Red Sea, has a hot and humid climate year-round. Taif, on the other hand, and Abha, enjoy much more temperate weather. Summer is hot with temperatures in some areas reaching 49°C (120°F). Winter is cooler with an average temperature of 23°C (74°F) in Jeddah and 14°C (58°F) in Riyadh. Winter temperatures drop below freezing in the central and northern parts of the country and snow and ice sometimes occur in the higher elevations in the south-west. In areas where there is little ground cover, a north-westerly wind blows for most of the summer months and may, especially in the eastern part of the country, whip up violent sandstorms. Between October and May is generally pleasant with cool nights and sunny days. Night temperatures in the coastal areas may dip into the 40s (Fahrenheit). From April to November, on the other hand, temperatures are considerably higher and life without air-conditioning would be very unpleasant indeed. Jeddah, the largest city in Saudi Arabia's Western Province, once nestled sleepily on the shores of the Red Sea, with no premonition of its prestigious future. Today it hums, glitters and resounds with industry, technology and cosmopolitan human life. The origin of the city's name poses an interesting dilemma for etymologists. Juddah (pronounced Jiddah) in Arabic means seashore, which seems logical enough, but the school of thought which prefers Jaddah or grandmother, is given credence by the traditional location of Eve's tomb within the city. Jeddah is, in fact, incorrect, but is popularly used by most non-Saudis living there. The story of Jeddah is one of expansion on a colossal scale. This expansion has been both rapid and recent, mostly within the past 20 years. A look at the figures is staggering. In 1947, the city encompassed no more than one square kilometre, and its population was about 30,000. Now, with a population of approximately one and a half million, Jeddah occupies an area of 560 square kilometres and stretches for 80km north to south along its coastline. Between the boom years of 1974 and 1980, the population of Jeddah doubled, and statistical experts predict that this figure will have doubled again by the end of the century. Jeddah is the Kingdom's principal seaport, the original gateway to Makkah and Madinah for pilgrims arriving by ship. Recently, the influx of pilgrims from abroad has increased dramatically with the building of Jeddah's International Airport and its architecturally unique Hajj terminal. Today, Jeddah welcomes 97% of all pilgrims arriving by sea and 98% of those arriving by air. This places huge demands on consumer goods, building materials, hotel accommodation, and technical and administrative services, thus providing an enormous boost to the city's economic prosperity. Jeddah has grown from humble origins. It began about 2,500 years ago as a tiny fishing settlement, established by the Quada's tribe. In AD647, Caliph Osman Ibn Affan chose Jeddah as the main port for the city of Makkah, and it became known as Bilad al Kanasil -- the City of Consulates. In the 16th century, the Ottomans built a stone wall around the town, in order to fortify it against attacks from the Portuguese. Originally, four gates were set in these walls, Bab Sherif opening towards the south, Bab Makkah facing east, Bab Madinah in the north wall and a west gate facing the Red Sea. Bab Jadeed, the new gate, was not built until the early 1900s and was wide enough to accommodate the motor car. Sentries were posted at these gates, which were closed at dusk. Entering the town after dark would, no doubt have proved a challenging business. Jeddah remained a fortified, walled town for centuries of Ottoman influence and was not released from Turkish rule until 1915. Further evidence of Turkish influence can be seen in Jeddah's architecture. The buildings of old Jeddah were tall and graceful, constructed of coral limestone and decorated with intricately beautiful wooden facades, known as rawasheen (singular roshan). These were designed not only to break up the sun's glare, but also to take advantage of the cooling sea breezes when the inner windows were opened. One cannot help but feel that, with the enclosure of the town within high, fortified walls, the sea breezes may not have stood much chance of reaching Jeddah's early inhabitants; hence their penchant for building their houses tall and for sleeping on the roofs on hot summer nights. Some of these beautiful old houses still exist in Jeddah, if you know where to look. However, their number is sadly declining and many are in a poor state of repair. An extensive renovation programme, run by the Historical Area Preservation Department, was set up in 1990 and aims to protect the city's architecture and heritage. The department now employs a staff of over fifty people and organises digs, tours and local research. In bygone days, the streets of Old Jeddah were twisting, unpaved and haphazard, flanked by closely-packed buildings. A thick layer of sand covered these streets, packed solid by numerous tramping feet. Mingling with the strolling inhabitants, water carriers and other street vendors, camel caravans once plodded their way through the wider thoroughfares, while goats and donkeys wandered in the narrow alleys. The souq was the heartbeat of Old Jeddah and is still an exciting and picturesque part of today's city. In those far-off days open-fronted shops grouped together according to trade; an old Oriental bazaar tradition, which has continued, to some extent, into modern life. Wares were displayed in the street under palm-leafed canopies, sheltering traders from the relentless sun -- a far cry from the modern-day comforts of air-conditioning in the luxurious shopping malls of the 1990s. When the Suez Canal opened in 1869, Jeddah became one of the main ports on the trade route between the Mediterranean Sea and the Indian and Pacific Oceans. As a result, the city's wealth increased dramatically, and Jeddah's inhabitants became more cosmopolitan. European diplomatic legations were established on the northern side of the city, and rich merchants began to build their family homes here. Sailors awaiting the departure of their ships on the spice routes often used their craft skills to decorate the facades of these dwellings. Pilgrims often brought goods from their native lands to sell in Jeddah, and those who could not afford the homeward journey often stayed on and settled here. These men sometimes married into a local family and became permanent residents of Jeddah. Modernisation of the city forged ahead with the passing of the years. By 1929 the first house of reinforced concrete had been built; less attractive than the delicate coral limestone, perhaps, but certainly a more durable alternative. 1940 saw the advent of electricity, 1948 marked the arrival of the first airfield, and in 1965 the first automatic telephone system was introduced. The reign of King Abdul Aziz and the unification of the Kingdom brought new stability to Jeddah, and its enclosing walls became obsolete. Expansion had become essential, too, and the city walls were therefore demolished. An interesting local story tells how the broken rocks from the demolished wall were used as fill for the new pier in Jeddah harbour, which was built to enable larger steamers to come alongside. The story is probably apocryphal -- a pity, if so, as there is a certain gentle irony in the idea that the rocks once used to discourage invading forces are now helping visitors to come ashore. Jeddah's building boom began in the Seventies and still continues at a breathtaking pace. New shopping centres, office building and apartment blocks are springing up everywhere. Stretches of former desert have now become part of an expanding, lush green city. Jeddah has successfully managed to combine the dignity and traditions of the past with the dynamism of the modern business world.